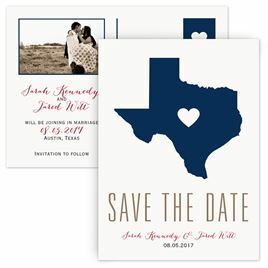 Save the dates should be sent 6-8 months before the wedding date. Send your save the dates even earlier for…read more. Who receives a save the date? Stick to the A list for your save the dates! Save the dates are for the people you want to make sure will be at your wedding. We’re talking…read more. Order one save the date per single guest and one save the date per couple/family. Remember to order a few extras just in case. Speed of shipment can vary depending on what you purchased but generally our customers are very happy if not surprised at how fast they receive their orders. Most stationery takes 1-2 business days to print and up to seven days to ship…read more. The best way to ensure a great turnout at your wedding is to send save the dates. Guests' schedules fill up fast, especially if you're planning a wedding during prime wedding seasons like summer and fall. You can bet many of your friends and family members already have a few weddings to attend around the same time as yours. Sending save the date cards is your best option for getting on their calendars early and making sure your loved ones can attend. Couples really love save the date magnets for this purpose. Magnets are conveniently displayed on the refrigerator making it easy for guests to remember your event. Maybe you've timed your wedding just right and are lucky enough to send Christmas save the dates. These holiday card and save the date card combos are clever, stylish and fun to receive! Not to mention they'll save you time and money. The fun part about save the dates is that they don't have to match your wedding style or theme. They are a celebration of your great news and your personalities. 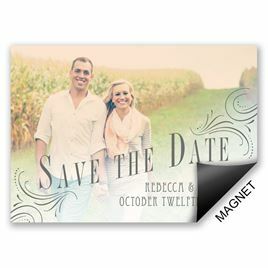 If you're looking for something more economical, we offer postcard save the dates in super cute designs. Maybe you're looking for a specific style, like rustic save the dates or vintage save the dates. We have lots of those and, of course, we offer a huge variety of photo save the dates! 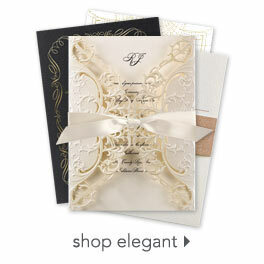 If you want save the date cards that match your wedding invitations, we have plenty of those to choose from as well. You will surely impress your wedding guests with all matching wedding stationery, from the save the date to the wedding program. Browse save the dates, wedding invitations and wedding stationery to see the full extent of what we have to offer for matching designs.